[prMac.com] Hoboken, New Jersey - Vega LLC today is proud to announce the release of ExpenseOnTheGo 1.0, its innovative new financial app developed for iPhone, iPad and iPod touch devices. 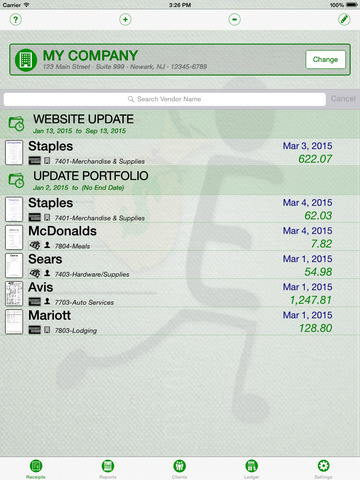 ExpenseOnTheGo will simplify recording and distributing your expense records. It's perfectly suited for personal and professional usage, and is one app that every shrewd person needs. This fantastic application performs those boring, hassle-filled and repetitive tasks that many people have trouble with. No one likes to track and submit their travel and expense reports to their companies as well as arrange and record tons of paper receipts. And no one definitely wants to spend their precious time going through bulky, cumbersome processes to prepare expenses so they can be filed. Lucky for us, we no longer need to! Thanks to this E-xceptional, E-fficient and E-asy to use app - ExpenseOnTheGo. If any of the following fits you, then, you need this app. All of these don't just sound dull, they actually are! And many people face them all on a daily basis. ExpenseOnTheGo will help you with All of these and much more. All you need to do is download the app and make your life both personal, and professional E-asy. ExpenseOnTheGo 1.0 is $3.99 USD (or equivalent amount in other currencies) and available worldwide exclusively through the App Store in the Finance category. Vega LLC is a high-tech startup organization with its headquarters located in the New York City area. We are independently owned and can accommodate a number of vertical industries. We specialized in the "back-office" type of applications - as we recognize that this area being one of the most vital in any organization. As our founder always says: "You can make as much money as you want, but if you can't control where they go - you will never succeed!" An innovative, dynamic and nimble organization, Vega LLC offers next generation, cutting-edge secure mobile solutions covering two major areas of the back-office lifecycle: Expense Management and Payment Solutions. Our aim is to provide our clients with a quality, robust and user-friendly mobile application, which delivers long-term business value, at prices affordable to everyone. All Material and Software (C) Copyright 2015 Vega LLC. All Rights Reserved. Apple, the Apple logo, iPhone, iPod and iPad are registered trademarks of Apple Inc. in the U.S. and/or other countries. Other trademarks and registered trademarks may be the property of their respective owners.